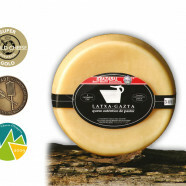 With excellent raw material obtained from the milk of Latxa sheep this cheese is made with Designation of Origin Idiazabal, a name taken from a small town in Gipuzkoa located on the slopes of the sacred mountain of Aralar, in the center of the Basque Country in an area with a pastoral tradition that goes back to more than four thousand years ago. It is a cheese made exclusively with milk from Latxa sheep from own shepherd’s development, rennet, lactic ferments and salt, with a minimum maturity of sixty days. The rind is hard, with pale yellow colour, and it is dark brown if it is smoked. Its pasta is compact, of variable colour, from white to yellowish ivory, it may present small and unevenly distributed eyes in small numbers. In addition to the features listed in the previous section, in order to obtain the qualification “Designation of Origin Idiazabal” the cheese should present typical organoleptic qualities in colour, aroma and flavor. Gold Medal in the World Cheese Awards 2010.